X is for when I sought vellum and a calligraphy quill fashioned out of a crow’s tail feather from the backyard. Oh the exhaustion of reaching X, be it down the alphabet or following it on a pirate map through perilous trials. To be sure, you the reader have arrived. But as of December 13th, you don’t have a map in hand, since it hasn’t been provided by that Gunmetal Pirate who’s been promising you a treasure hunt for months. When you do come back with a map, or rather, with the instructions and riddles whose clues lie in the treasure hunt posts, the above babble might make sense to you. So ignore the April publish date because I’m a cheater. This post is actually being written in December, which means it’s taken your weary Pirate Geisha eight months to get here. Kill me — I’m incapable of making anything easy for myself. In the end, every cheating alphabet post took up painstaking hours of culling images along with the pertaining words — which still managed to sneak in bits of me and my neuroses even though they were supposed to be about picture-taking. Meanwhile, no one knows these posts exist, because they were privately “published” basically a year ago, only to be filled with content recently. For every week that it appears as if I’m not posting anything new, I lose about a thousand readers (yeah yeah, figuratively). Still, I tend to these April, read-by-no-one alphabet posts like they’re prisms in some torturous rainbow leading to a dubious pot. Turns out there are X’s everywhere. At least the treasure hunt I’m devising — to get you to meander through these effortful pictorials of mine — won’t be dubious. Why? Because it’s a treasure hunt inspired by this spectacular fairy party, and Tintin. Wait, you don’t know Tintin?! Allow me the pleasure of educating you in the elegant, eighty-year-old comic. Not only have I geeked over Tintin for forty years (I’m a vampire, dammit, just forget my age), but I dream about him. By “dream” I mean during my nighttime sleep as a midlifey (but still alluringly youthful) woman. 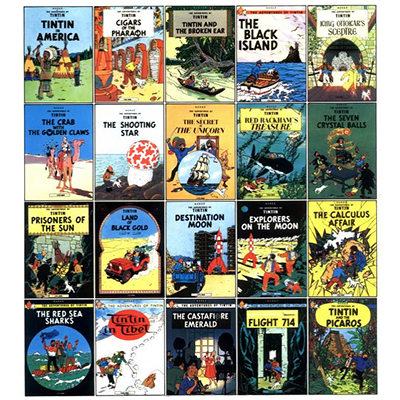 Anyway, here’s some Tintin math for you: Since I was seven, I’ve read each of the the twenty-four Tintin books no less than two dozen times in four languages (Farsi, English, French and Italian). Those dreams of mine I mentioned consist of new or undiscovered Tintin adventures — a sort of involuntary slumberland fan fiction. Hence, they’re dreams of longing, like every other recurring dream of mine. Incidentally, if you want to understand the extent of my “geeking over” Tintin, on the site’s not-in-English quiz, I scored 100% even with my shoddy, out-of-practice French. Around the age of seven, I first read The Secret of the Unicorn, with its adventure trail of pickpockets, a trio of antique model ships, and pirate legends leading to three cryptic pieces of parchment. 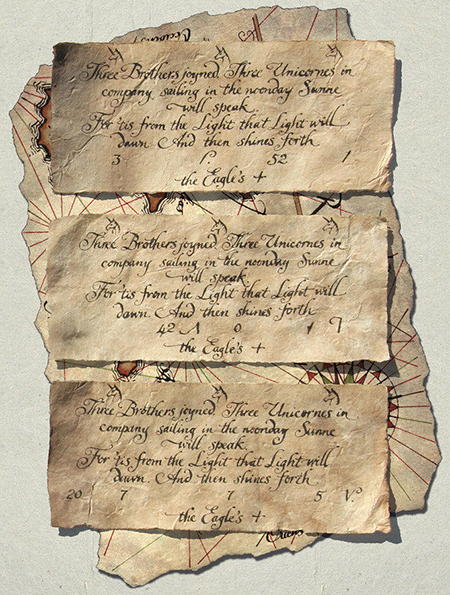 Uniting the three revealed a set of symbols joining into latitude and longitude coordinates — a treasure map. Immediately after, I sought vellum, ink, a candle, and from the backyard, a crow’s tail feather to fashion into a calligraphy quill. I wanted to recreate the riddles and overlap them, illuminating the result above candlelight. The purpose wasn’t to find make-believe treasure, but to create a step-by-step puzzle. Some forty years later (gulp), the brain shared by that seven-year-old is filled with the same “wonder and excitement” at possibility, and at creating a treasure hunt. Courtesy of the wealth of resource that is the internet, and nothing to do with my (clumsy) attempt at the age of seven. Some of you have signed up to receive instructions and a start date for such a treasure hunt. When it’s all set to go, you’ll be the first notified. Thanks for bearing with me. Something fun is lurking here. I’m aware of Tintin, but have not read him. The first real book I remember reading, with help (yes, that young), was Heinlein’s Rocket Ship Galileo, followed by jules Verne (all), Treasure Island, and onward. Treasure hunt, you say – Hmmmm. I think the first book I read without help was Pippi Lonstocking.